It looks like a lot of companies have stepped up to deliver high quality Black Ops 2 themed gaming peripherals for Call of Duty fans. First we have SteelSeries releasing exclusive premium-quality PC peripherals: a gaming mouse and three QcK mousepads featuring BO2 artwork. Ability to create and store an unlimited amount of profiles and macros. The mouse also comes with pre-defined profiles created by professional COD players. Coated with hand-sweat resistant material. Orange illumination with a Black Ops II theme. Pro-grade laser sensor supporting up to 5,700 CPI. Equally comfortable in either hand with 7 programmable buttons. The XL-sized UPE material feet glide effortlessly across almost any surface. The QcK Mousepads have non-slip rubber bases holding them in place and feature a surface that offers a smooth and consistent glide for your mouse. The mousepads are priced at $14.99 / 14.99€ each. 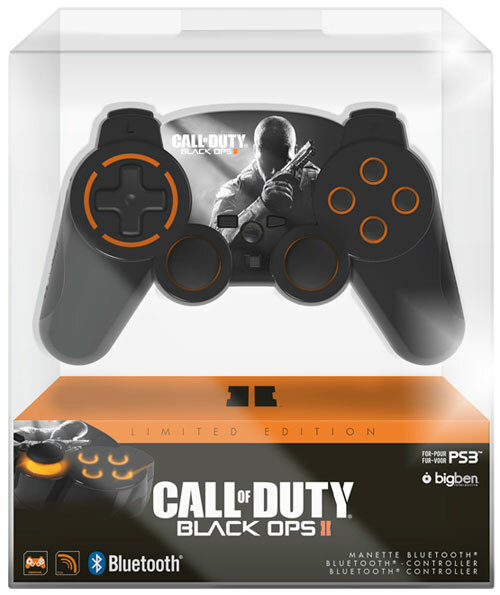 BigBen Interactive has also announced their BO2 themed Bluetooth controller. The wireless controller has been made for PS3 gamers in mind, but since it's Bluetooth-based, it should work on PCs with a Bluetooth adapter. Amazon France has the controller on sale for 49.99€, which is about $64. The controller is backlighted and has non-slip, ergonomic triggers and rubber grip. As with most PlayStation 3 controllers, it features a 6-axis and tilt sensor with 2 vibration motors. It also has a rechargeable NiMH 700mA battery and can be recharged with a USB cable.